The government is to reveal a package of "radical reforms" aimed at making it easier for British firms to bid for government contracts. The Cabinet Office hopes the proposals, which include putting contracts worth £50bn online, would stimulate growth. Minister Francis Maude said it cost twice as much for a firm to win a UK government contract as a French one. He said he wanted to end a "short-sighted and risk averse approach" to awarding major deals. Earlier this year the government was blamed for Derby-based train builder Bombardier axing 1,400 jobs after it opted to buy rolling train stock for the Thameslink service from a German company. Ministers said at the time EU laws stopped them from giving preference to British firms. But Mr Maude said under the new plans it would be 40% faster to do business with Whitehall and said potential opportunities for private companies would be flagged up earlier. He added that UK-based suppliers were "finding themselves excluded", and said opportunities for growth were being missed "due to the public sector's timidity". "We need to make things better for business in the UK - the current system isn't working," he said. "While other countries manage to settle down and develop long-term relationships with business, this country appears to have taken a rather less successful, overly formal, and legalistic approach, failing to think beyond the immediate contract and failing to adequately support our businesses." The government will have an "open door" policy with suppliers to discuss future contracts and departments will be encouraged to break up some major contracts to make it easier for small and medium-sized enterprises (SMEs) to bid for the work, said Mr Maude. He also told the BBC's Andrew Marr programme that taxpayers were not getting value for money under the current system. "The public sector in this country spends a huge amount of money in buying in goods and services from outside, something like £230bn a year, and we don't do it very well, frankly. "We follow the European law extremely literally, and they have very legalistic processes. We have very big contracts, and we get the worst of both worlds at the moment. "We don't buy very well, we exclude a lot of competitive, innovative suppliers who will tend to be UK-based, so neither do we get good value for the taxpayer, neither do we spend the money particularly well, nor do we actually support UK businesses." All but the most complex procurement processes must be finished within four months from January next year, compared to an average of more than seven months now. Whitehall also plans to create a commissioning academy to dispel any myths that have built up around procurement and train public sector commissioners in how to be "confident and courageous" when awarding contracts. 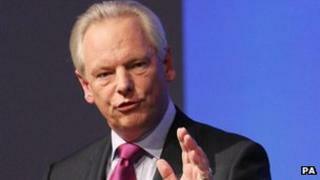 Mr Maude will travel to Brussels on Monday to press for EU rules over government procurement to be simplified.